Windtraveler: It Gets Worse Before it Gets Better: First Day on the Boat or "What a Difference a Day Makes"
It Gets Worse Before it Gets Better: First Day on the Boat or "What a Difference a Day Makes"
I felt the panic rising inside me. My chest started to tighten and I couldn't seem to catch my breath. It was about 99 degrees inside our boat, the babies were fussy, hot and tired and we'd just had about $1000 worth of provisions delivered to our cockpit. "Overwhelmed" doesn't even begin to scratch the surface of what I was feeling at that moment. "Oh my god. I don't think I can do this" I said to Scott as our already tiny living space closed around me with cans, boxes and bushels of food all over the place. Tears welled up in my eyes as I surveyed our boat. Where did we store all this stuff before? What was our method? Where should I start? 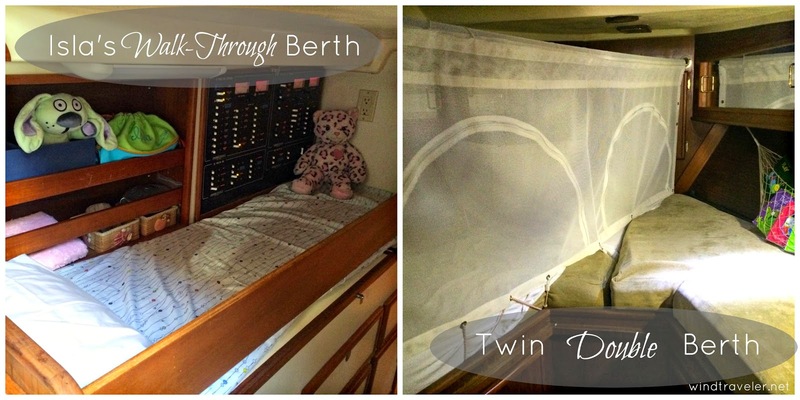 The babies were in their new bunk, screaming their heads off and refusing sleep, and ten boxes of provisions were sitting in our cockpit under the hot sun, needing to be stored, immediately. Because we had completely emptied our boat before we left her on the hard, we needed everything in the way of foodstuff - from spices to condiments to staples - and the thought of putting it all away, without much of a plan and accompanied by screaming babies and the unrelenting midday heat of the tropical sun, put me over the edge. "We've made a huge mistake" I said, finally breaking down into tears. "This is not going to work" I sobbed. I was totally and completely overwhelmed. Frozen. Stuck. Helpless. "Go" Scott ordered me. "Go, now. Take a walk." So I did. I left Scott alone in our ungodly hot boat with ten boxes of food to store, a loopy toddler and two screaming babies. It was not my finest hour. As a parent, there is only one thing that can truly send me over the edge and that is sleep. My babies' lack of sleep, in particular. To me, sleep is as vital as water and food to a growing child, so when my children aren't sleeping well - I get very stressed out. When we moved aboard that afternoon last Saturday and our exhausted, sweaty babies began to scream in protest when I put them down for their usual (and typically, easy) 1pm nap - I got nervous. Would they ever learn to sleep on the boat? Would my former good sleepers return to the dreaded days of waking up every two hours? Already it was clear that the divider we'd had sewn into their bunk was useless - Haven climbed right over it and onto Mira the second we put them on their respective sides. It looked like they'd have to learn to sleep in one bed, together, again - something they hand't done since they were two or three months old. Would they smother each other? Would they kick each other awake? Was this *ever* going to work? All of these questions, combined with my other achilles heels; disorder and provisioning (and an already weakened emotional state due to my mom leaving earlier that morning), turned out to be the trifecta that would literally send me over the edge "anxiety attack" style. When I returned to the boat from my walk, Scott popped his head out of the hatch, "They're asleep!" he said with a smile, knowing full well that armed with this knowledge, my worry would diminish and my mood would improve considerably. It did. Suddenly, the provisions were not so daunting. I snapped out of my mental fog and got down to it. We had provisioned online (very useful if you are on Tortola, no extra charge and delivery is free) so we had the master list of what was ordered and needed to check off each item to make sure we got what we paid for. Isla played quietly in her new bunk with our iPad and Scott and I got to work storing everything. An hour later we were finished. The boat was put back together, order was restored, and the babies were getting up from their nap. All was well. At bedtime, chaos reigned once again. Isla has entered - with a vengeance I might add - the "trying threes" (we sort of bypassed the "terrible twos" but the tantrums seem to have been gathering steam during this dormant period) and, as such, she is now prone to outbursts of epic proportions over things like 'what color crocs to wear', 'which jammy top to put on' and 'when and where to sleep'. Getting her into her new bunk was a total disaster. She was not having it and because she hadn't napped that day (she sleeps in the walkway of our boat so there was no way she'd have been able to sleep as we stored all those provisions) she was particularly vociferous. "Should we just book our return flights now?" Scott asked me, defeated, between her scream surges. "Probably" I said, exhausted, as I went back to her to try and calm her. This was not looking good for us and, after she finally passed out from exhaustion, I left the boat again that night to sit on the beach and cry. I was certain we'd made a colossal mistake. When we all woke up the next morning, well-rested and happy, suddenly everything seemed a lot better. The babies didn't wake up every two hours in the night like I'd predicted and Isla slept the whole night without incident in her new bed. My worry of being up all hours tending to wailing children was all for naught and the reminder that, yes, children are adaptable and do adjust, gave me a new perspective on our situation. Namely: We were going to be okay. We've been living on our boat at the dock now for five days and I can honestly tell you each and every day has gotten a little better, and a lot easier. We are finding our groove and it feels so good. We're slowly perfecting how and where we stow things. We're developing little routines that make our lives a little easier. We've done away with the twin bunk divider and now Haven and Mira sleep together without issue. Isla loves her little walk-through bed and (mostly) goes to bed without protest. All three wake up happy and seem to have absolutely no issue that our living space has gotten significantly and incrementally smaller over the past month. They are happy and loving life. 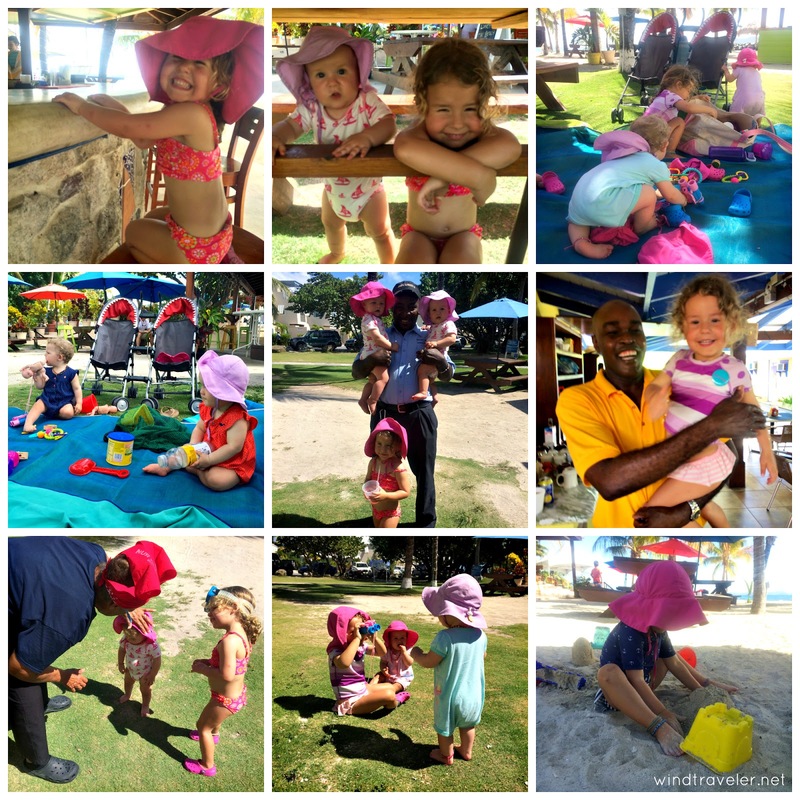 We've really enjoyed our time at the Nanny Cay Marina and our kids have become the marina darlings, with all the staff from the waiters to the bartenders fawning over them. It's so fun and wonderful to see. Isla runs down the docks like she owns the place with a big smile, giving fist bumps to the gardeners and marina workers. 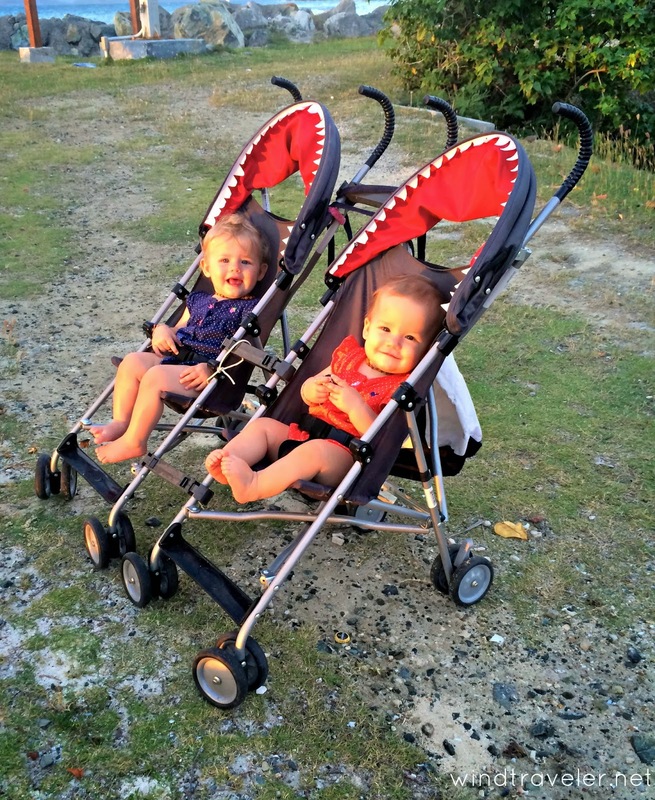 I follow behind with the twins in their tandem shark stroller and rare is the passerby that doesn't stop to gawk at them. While the girls and I are out and about, Scott works on the boat, fixing this and that, trying to get us as ready as possible so that when we are anchored out and away from the ease of mainland we have fewer issues. We are leaving today and while we are sad to leave, we'll be back for sure. This place and the community here have begun to feel like a home of sorts but we're anxious to start our life off the dock. There will be more changes and adjustments once "out there" of course, but we'll figure it out. All in good time. I'm not going to lie: it's not easy brining three babies on a boat and it is certainly not for the weak of heart. "You are brave" is a phrase I hear daily around here when people hear our story, but they always follow it with, "How amazing for your family." There are moments in every day where we look at each other in exhaustion and say, "this is really hard" but you know what? Being a parent anywhere is hard. So, to us, it might as well be on a boat in paradise. So far, life is good. Really good. We're doing this, it is working and we're going to be okay. Dear Scott and Brit, You write so openly about the less than joyous events of life, especially the cruising life, which landlubbers assume is one big piece of cake. Lest you think you are alone in the process, we made an overnight passage once and were dead tired upon arrival at our destination. We argued, complained, hated life at that moment; then napped. After that, all was well with the world. Sleep is the best antidote. Rest well and enjoy your time together. There are moments in every day where we look at each other in exhaustion and say, "this is really hard" but you know what? Being a parent anywhere is hard. So, to us, it might as well be on a boat in paradise. Preach. Inspiring and inspired words for life. Thank you for your unapologetic affinity for telling it how it is. Really enjoy reading your blog and appreciate your honesty. 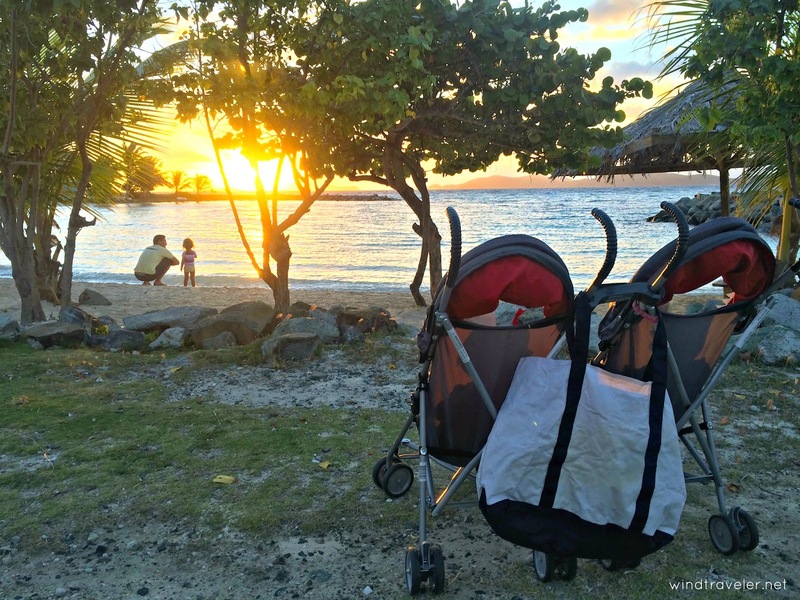 We only have one toddler on board so its comforting to know we're not the only ones going through these experiences - the good, the not so good and the journey in between.